The Turkish Ottoman Empire had pockets of sovereignty in the Arabian lands. It became little more than a shell in Egypt, Syria and Irāq by the eighteenth century. As for the Arabian Peninsula, then the Ottomans never inhabited the vast areas of the Najd, the region in which Ibn ʿAbdul-Wahhāb was born and raised. Though they controlled Baghdād and Basrah in Irāq, the closest they came to the Najd was al-Ahsā in 1592CE, and they had a Turkish garrison at al-Hufoof, however only eighty years later the Bedouin tribe of Banu Khālid fell upon the Turks and expelled them. That was nearly a century before the birth of Shaikh Muhammad bin ʿAbdul-Wahhāb . Political power in the Najd itself had broken into minute particles for centuries, the Turks had never ventured in that far. 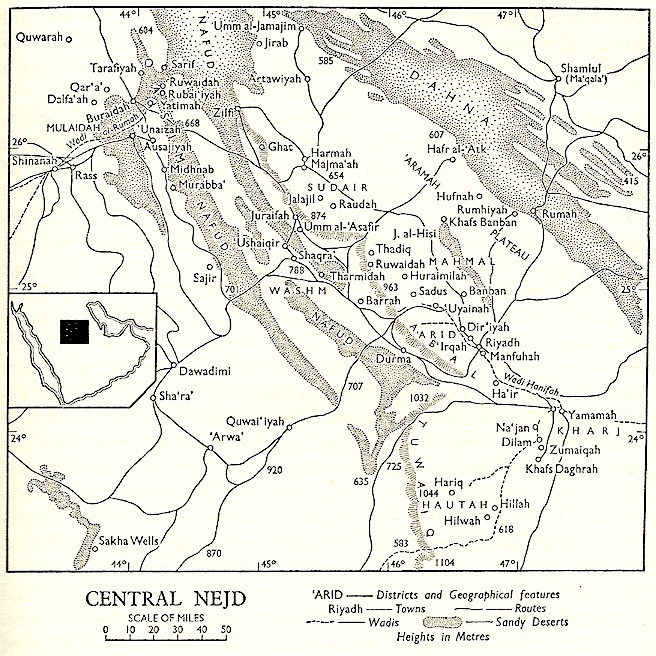 Ibn Bishr , a historian and biographer of Ibn ʿAbdul-Wahhāb and the region of Najd, the birthplace of the Saudi state, mentions the case of the tiny settlement of Tuwain in Sudair, Najd where in 1708CE, four leaders were competing for the right to rule. None of the four was individually strong enough to overcome his rivals, so they divided this small settlement into four regions, so that each could be a sovereign over a quarter of the town. So the claim that Shaikh Muhammad bin ʿAbdul-Wahhāb and the ruler of the first Saudi state, Imām Muhammad bin Saʿūd rebelled and took authority from the Ottoman Empire in Arabia is factually and historically incorrect. Shaikh Muhammad bin ʿAbdul-Wahhāb was raised in a family of scholars and judges. His father was a leading judge (qādhī) as was his grandfather and he studied under his paternal uncle who was a scholar also. Muhammad bin ʿAbdul-Wahhāb memorized the Qurān before the age of ten. He went on to study Quranic commentary, hadīth literature and hadīth science, jurisprudence and the rest of the Islamic sciences, so much so that his father would seek his opinions on religious subjects. He studied in the centres of Islamic learning in Madīnah and Basrah in Irāq under notable scholars of the time. Shaikh Muhammad bin ʿAbdul-Wahhāb wrote and strived to convince people against false practices that were foreign to the Islāmic teachings contained in the Qurān and Prophetic Sunnah. The ruler of Dirʿīyyah, Muhammad bin Saʿūd became convinced of the teachings of the Shaikh and aided him in eradicating false practices and uniting the people under a single ruler instead of warring tribes. They faced much opposition in the early years from various tribes and village leaders, which resulted in many skirmishes and battles. Eventually Imām Muhammad bin Saʿūd managed to unite the region of Najd and beyond under his rulership. * Map: Saudi Arabia In the Nineteenth Century, R. Bayly Winder, MacMillan, 1965. 1 For a detailed discussion in English see Rentz, George. S, The Birth of the Islamic Reform Movement in Saudi Arabia, Muhammad b. ʿAbd al-Wahhāb (1703/4-1792) and the Beginnings of the Unitarian Empire in Arabia, Arabian Publishing, London 2004. One can benefit much from this work. 2 See Ibn Bishr, ʿUthmān bin ʿAbdullāh, ʿUnwān al-Majd fī Tārīkh Najd, in two volumes. 3 These Sūfī practices are still common and widespread throughout the Muslim world and are even regarded by many as ‘mainstream’ Islām, yet in reality they contradict the worship practised by the Prophet and his Companions. 4 Ibn Ghannām, Husain, Rawdatul-Afkār wal-Afhām li Murtād Hāl al-Imām wa Tiʿdād Ghazawāt Dhawil-Islām, in 2 volumes. From the book: “The Rise of Jihadist Extremism in the West”, Salafi Publications, Birmingham.